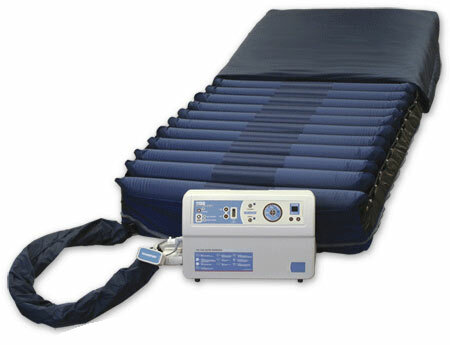 The American Medical Equipment AME1500 with 3-zoned support surface with vented air cells to provide True Low-Air-Loss Therapy. For added patient protection these air cells rest on a 2" covered foam safety pad. The quilted top cover is waterproof, highly vapor permeable and completely machine washable. The unique CPR release makes deflation quick and easy for correct patient positioning. The user-friendly control unit is simple to operate with cost effective therapeutic outcomes. The True-Low-Air Loss therapy diffuses under the patient over 100 liters of air per minute. This therapy helps keep the patient dry and comfortable. The adjustable pressure settings are instantaneous for accurate patient placement. The unique filter placement makes hassle free changing or cleaning without using tools or removing filter covers. 3. Strap air support mattress to bed frame on all four sides. 4. Place control unit on the footboard of the bed using the two retractable hooks located on the back of the unit. (If no footboard is available, put blower on the floor away from traffic.) To avoid blocking the air intake, DO NOT place control unit on its back. 6. NOTE: (110V unit ONLY) Plug unit into grounded 110V A/C outlet. 7. NOTE: (220V unit ONLY) Plug unit into grounded 220V A/C outlet. 8. Turn master power switch, located on the side of the unit, “on”. 9. Press the Autofirm button for quick inflation. 10. Press the Firm or Soft button on the control panel to select the desired level of firmness. 11. Place the patient on the bed after inflation to insure the air cells do not become twisted or kinked. a. When elevating the head section of the mattress, press the Fowler button to increase airflow for seat inflation. a. When elevating the head section of the mattress, Fowler mode will automatically turn on. b. Press and hold the Lock-out button for 3 seconds to disengage the lock-out feature. Notice: The mattress is equipped with a 2-inch foam pad in the mattress base for patient support and transport.